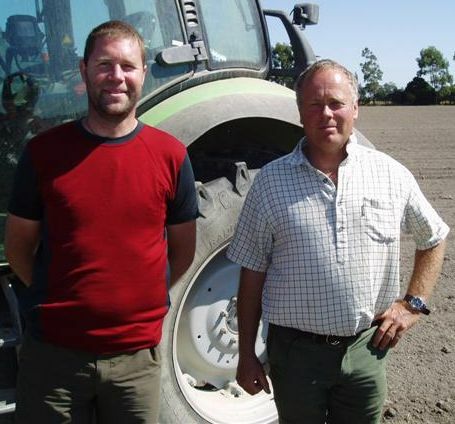 Physical Weeding is the trading name of Steam Weeding Ltd a New Zealand based limited company owned and run by Tim Chamberlain (right) and Charles 'Merf' Merfield (left). Tim is a fourth generation farmer, and owns and manages Harts Creek Farm the families mixed cropping farm. He also runs two other mixed cropping farms, a hill country livestock property and he is a shareholder in a 14,500 stock unit hill country property in Waipara. All properties are Bio-Gro certified. He has been farming organically for over twenty five years. He is widely recognised in the organic movement for his advanced production systems and has won a number of innovation and environmental awards. Merf is an organic agronomist (crop scientist) with expertise in production systems, weed management, machinery, soil and nutrient management and has been using and building thermal weeders and a wide range of other equipment for twenty years. He originally hales from England where he studied commercial horticulture at Writtle College, and has managed organic horticultural farms in both the UK and New Zealand. His postgraduate studies included computing, management, ecology with a specialism in biological control for his Masters degree and organic crop production including vegetable seed crops, plant pathology, seed quality, and thermal weeding, both machinery design and novel uses for his PhD. He has recently finished a two year contract as the Republic of Ireland's lead organic scientist based at Teagasc Johnstown Castle. He is now head of the Future Farming Centre, based at Lincoln University, New Zealand.